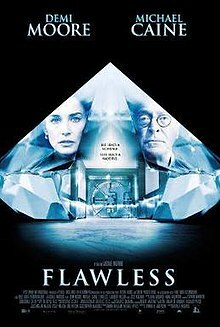 Flawless is a 2007 British fictional crime film directed by Michael Radford, written by Edward Anderson, and starring Michael Caine and Demi Moore. It premiered 11 February 2007 in Germany. The film had a limited release in the United States on 28 March 2008. A reporter enters a restaurant to interview Laura Quinn, the only woman to ever have been a manager at the London Diamond Corporation, for a puff piece about the first generation of women entering the workforce. Quinn places a box on the table, revealing a huge diamond, and says, "I stole it." The reporter, suddenly enthralled, assumes that Quinn has been in prison for the theft all this time. The story then flashes back to 1960, when Quinn was still employed as a manager at London Diamond Corporation. She is passed over for a promotion for the sixth time despite being intellectually superior to her male co-workers. Quinn discovers that she is getting fired from the janitor, Mr. Hobbs. He offers her a place in a plot: stealing enough diamonds to make them rich, but not enough to be noticed. Knowing she is considered old by her coworkers and has few other professional prospects, she agrees. Quinn and Mr. Hobbs hatch a plan, exploiting a weakness in the new camera security system. However, Mr. Hobbs steals every single diamond from the vault, almost two tons worth, and holds them for a ransom of 100 million pounds. The head of the insurance syndicate from King's Row is forced to pay the ransom, leaving him financially ruined. Quinn, having never agreed to this, now finds herself trapped. The company hires a private investigator, Mr. Finch, to keep the matter from going public. Suspicious from the start, Mr. Finch keeps a close eye on Mr. Hobbs and Miss Quinn. Quinn wants to avoid jail time by giving the diamonds back but Mr. Hobbs refuses. Having no idea where he's hidden them she conceals their scheme. The situation escalates as the diamonds are not returned, the incident is leaked to the Press, and the president of London Diamond Corporation has a heart attack due to the stress. Feeling cornered while out for a drink with Mr. Finch, Miss Quinn runs to the bathroom and cries uncontrollably. After losing her diamond earring down the drain, she gets an idea as to how the heist could have been pulled and where the diamonds could be. Excusing herself, she goes down into the sewer under the company and finds Mr. Hobbs guarding a passage. He pulls a gun on her, but she finds a huge diamond at her feet. Mr. Hobbs confesses that he has no interest in the diamonds or the money, and wants to ruin the head of the insurance syndicate whose deliberate delay in covering his wife's medical expenses resulted in her death many years before. Once the deadline for the ransom has passed, resulting in the insurance head's suicide, Mr. Hobbs leaves. Miss Quinn finds the rest of diamonds and calls Mr. Finch claiming she followed a hunch. While there is sufficient proof that she was involved in the incident, Mr. Finch is unwilling to press charges against Quinn. Finch instead acts by helping the company recover the stolen property and implying to the press that the theft was just a rumor. The story returns to the present. Quinn tells the reporter that she resigned and shortly after received a letter from a bank in Switzerland: Mr. Hobbs apologized for involving her, needing a disgruntled employee for access to the diamond vault, and as compensation gave her the ransom money. Quinn details how she spent the rest of her life donating all of the money left to her to many different organizations and people in need. She has returned to London after a long absence only to tell the story and leave the diamond she found in the sewer, calling it the last reminder of the woman she was. The film received mixed reviews from critics. As of 24 April 2008, the review aggregator Rotten Tomatoes reported that 56% of critics gave the film positive reviews, based on 93 reviews. Metacritic reported the film had an average score of 57 out of 100, based on 21 reviews. The film was released 5 October 2007 in Spain and has grossed $2.2 million there as of 6 January 2008. ^ "Flawless (2008) – Press Kit". Magnolia Pictures. Retrieved 25 September 2008. ^ "Flawless (2007) – Release dates". Internet Movie Database. Retrieved 29 March 2008. ^ "Flawless Movie Reviews, Pictures – Rotten Tomatoes". Rotten Tomatoes. Retrieved 3 October 2008. ^ "Flawless (2008): Reviews". Metacritic. Retrieved 15 June 2008. ^ "Flawless (2008) – International Box Office Results". Box Office Mojo. Retrieved 29 March 2008. This page was last edited on 24 February 2019, at 05:08 (UTC).